The National Academy of Design is an honorary association of American artists, founded in New York City in 1825 by Samuel Morse, Asher Durand, Thomas Cole, Martin E. Thompson, Charles Cushing Wright, Ithiel Town, and others "to promote the fine arts in America through instruction and exhibition." National Academy of Design, one of many Gothic Revival buildings modeled on the Doge's Palace in Venice, seen c. 1863–1865. This building was demolished in 1901. The original founders of the National Academy of Design were students of the American Academy of the Fine Arts. However, by 1825 the students of the American Academy felt a lack of support for teaching from the academy, its board composed of merchants, lawyers, and physicians, and from its unsympathetic president, the painter John Trumbull. 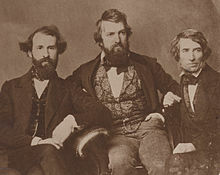 Samuel Morse and other students set about forming "the drawing association", to meet several times each week for the study of the art of design. Still, the association was viewed as a dependent organization of the American Academy, from which they felt neglected. An attempt was made to reconcile differences and maintain a single academy by appointing six of the artists from the association as directors of the American Academy. When four of the nominees were not elected, however, the frustrated artists resolved to form a new academy and the National Academy of Design was born. Morse had been a student at the Royal Academy in London and emulated its structure and goals for the National Academy of Design. After three years and some tentative names, in 1828 the academy found its longstanding name "National Academy of Design", under which it was known for one and a half centuries. In 1997, newly appointed director Annette Blaugrund rebranded the institution as the "National Academy Museum and School of Fine Art", to reflect "a new spirit of integration incorporating the association of artists, museum, and school", and to avoid confusion with the now differently understood term "design". This change was reversed in 2017. The Academy occupied several locations in Manhattan over the years. Notable among them was a building on Park Avenue and 23rd Street designed by architect P. B. Wight and built 1863–1865 in a Venetian Gothic style modeled on the Doge's Palace in Venice. Another location was at West 109th Street and Amsterdam Avenue. Since 1942 the academy has occupied a mansion at Fifth Avenue and Eighty-ninth Street, the former home of sculptor Anna Hyatt Huntington and philanthropist Archer M. Huntington, who donated the house in 1940. The academy is a professional honorary organization, with a school and a museum. One cannot apply for membership, which since 1994, after many changes in numbers, is limited to 450 American artists and architects. Instead, members are elected by their peers on the basis of recognized excellence. Full members of the National Academy are identified by the post-nominal "NA" (National Academician), associates by "ANA". The school offers studio instruction, master classes, intensive critiques, various workshops, and lunchtime lectures. Scholarships are available. The museum houses a public collection of over 7,000 works of American art from the 19th, 20th, and 21st centuries. As of November 2018 the academy's Board of Governors consists of 18 board members, with Bruce Fowle as President (since 2010) and James Siena as Chairman of the Abbey Council. Maura Reilly serves as Executive Director since 2015. Among the teaching staff were numerous artists, including Will Hicok Low, who taught from 1889 to 1892. The famous American poet William Cullen Bryant also gave lectures. Architect Alexander Jackson Davis taught at the academy. Painter Lemuel Wilmarth was the first full-time instructor. Silas Dustin was a curator. ^ "Charles Cushing Wright (1796-1854)". Retrieved August 14, 2017. ^ Dunlap, William (1918). A History of the Rise and Progress of the Arts of Design in the United States (Vol. 3). C. E. Goodspeed & Co. pp. 52–57. Retrieved February 17, 2008. ^ Historical Overview, National Academy of Design. ^ Annette Blaugrund as quoted in Traditional Fine Arts Organization, News: National Academy Clarifies Identity with Change of Name and New Visual Identity. ^ "Painting by Dustin". fineart.ha.com. Retrieved October 19, 2010. ^ Board of Governors. "National Academicians". The National Academy. Archived from the original on 16 January 2014. Retrieved 22 January 2014. ^ Erin Corley (2007). "American Watercolor Society records, 1867-1977, bulk 1950-1970". Archives of American Art Oral History Program. Retrieved June 17, 2011. Wikimedia Commons has media related to National Academy of Design.